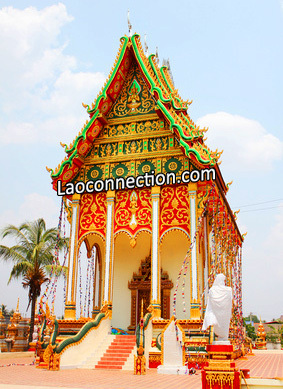 In a country where communist austerity is common and displays of wealth were once considered bad taste, the Lao temple was one area where all out beautification of buildings were done. They are built from the donations of the surrounding community. You can sometimes find the names of donors written or painted on different parts of the temple. It should be mentioned as well that donations aren't just local but sometimes come from abroad as well. Additionally, while certain aspects of the construction are paid such as the materials, most of the work is done by volunteers. 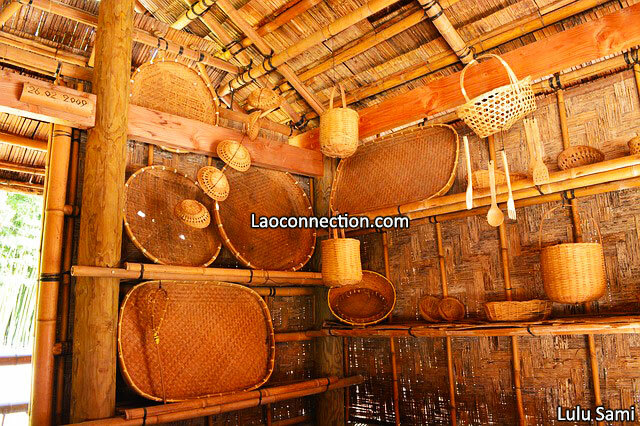 LaoStarTV's show Tum Geen Yu Tin Lao (ທຳກິນຢູ່ຖິ່ນລາວ) visited a Lao rice farmer who utilizes modern machinery and equipment to till the land and plant the rice. It's a contrast to just a few years ago when manual labor was used at almost all stages of rice farming. Part 1 of 3 shown below. Video Credit: Manichanh Phanyakeo on Youtube. 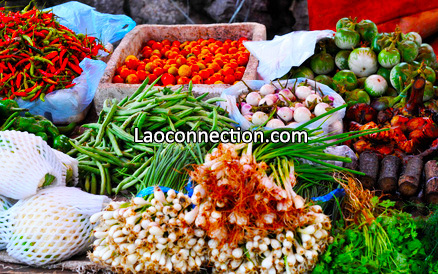 as part of the Lao New Years 2559 (2016) celebrations. 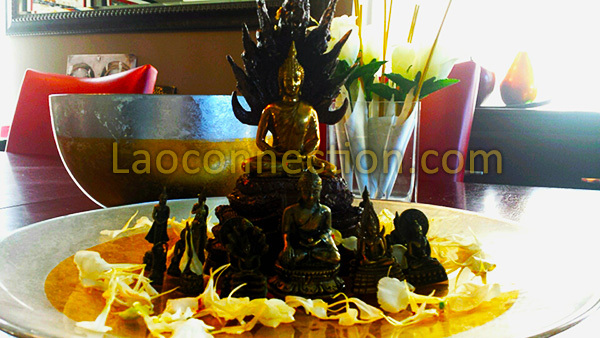 I'd be the first to admit that I'm not always the most conventional person when creating my once a year pop-up Buddhist altar in my home which I do during Lao New Year. It was something my parents taught me. I just used what I had and I encourage others to do the same! 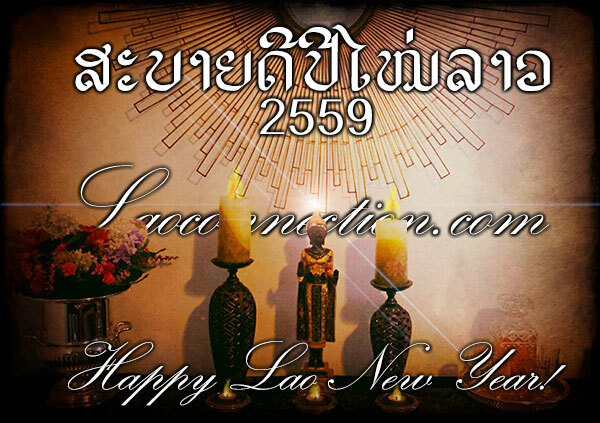 this Lao New Year 2559 (2016). Photo Credit: Laoconnection.com. Actual photo from my living room. 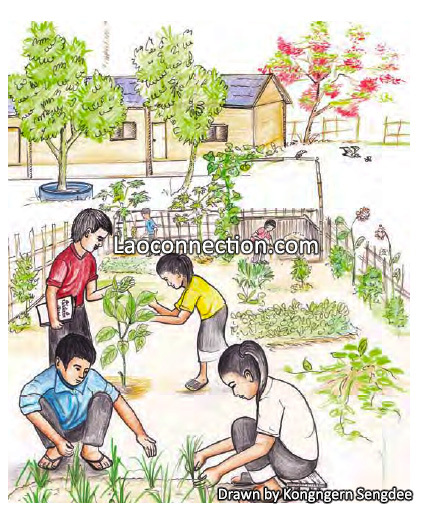 The Japanese international non-government organization Action with Lao Children (ALC) is partnering with the Department of Education and Sports to promote reading and literacy, for this year's Lao Book Festival 2016. Inspection authorities have uncovered more than 86,744 cubic metres of illegal logs, the illegal importation of 978 vehicles, and also discovered banking officials taking customers’ money, during inspections carried out in 2015. The illegal logs were found after the authorities investigated suspicious incidents in 12 provinces and Vientiane, according to the 2015 report from the Inspection Committee of the Party Central Committee, and the Government Inspection Authority. The Lao Bar Association has announced it will continue the provision of free legal aid to the general public this year after the sponsor, Asia Foundation, announced it would continue funding the project. The association made the announcement last month through various media outlets.